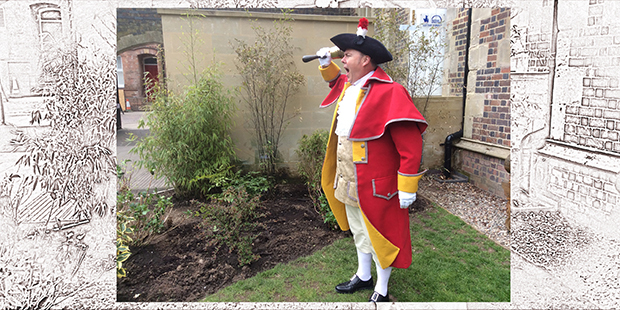 With style and design references to the Warwickshire 6th of Foot, and the Warwickshire Fusiliers, I gave my new Town Criers livery its first outing in the grounds of the Warwickshire Yeomanry, cap badge to follow soon. I was pleased that it arrived in time for the Shakespeare Birthday Celebrations in Stratford Upon Avon, and was one of 4 local Town Criers, that joined in with the Towns Beadle in ringing our Oyez’s to accompany his “Three cheers”. Although I’ve now done a few events, my appointment will be made official at the Mayor Making Ceremony on 14th May.